Rise – San Diego Chargers – Don’t look now, but the Chargers seem to be putting together their typical late-season charge. They blasted the Bills 37-10, in large part to a fake punt that safety Eric Weddle called and then ran. The Bolts are now 6-7, but they’re still looking up at both the Raiders and the Broncos in the AFC West. While they probably won’t make the playoffs, they are dangerous once again – and that’s enough to put them on the rise. Sink – San Francisco 49ers – While the 49ers are still in line for a first-round bye in the NFC playoffs, Sunday’s 21-19 loss to the Cardinals revealed one of the team’s weaknesses – red-zone offense. The 49ers can’t count on playing low-scoring games throughout a playoff run, but that’s what they’ll have to do if they can’t solve the red-zone woes. Maybe they will, but for now we have no choice but to knock them down a level. Float – Atlanta Falcons – The Falcons gave up 23 straight points in the first half against the Panthers, but they rallied with 24 unanswered second-half points for a 31-23 road win. The game revealed that the Falcons still have some problems – most notably, a defense that is far from the shut-down level and a hole at right guard. But it also showed that adding rookie WR Julio Jones in the offseason made the Atlanta offense more explosive and gave the Falcons a much bigger margin for error. That’s a big step forward. We still don’t see the Falcons winning a game in the playoffs, but they should make it, and if Jones and Roddy White go nuts in a playoff game, who knows? *Note: We are going to reconfigure the top of the comparison to better separate playoff teams, which may change the levels of some teams. Rise – Houston Texans – The Texans keep losing quarterbacks, but they keep on winning. They moved to 9-3 behind T.J. Yates and a strong running game with a 17-10 win over the Atlanta Falcons. Houston’s run game and defense will allow it to win more traditionally down the stretch, and with just another couple of wins they should be safe to make the playoffs. No matter what happens in January, that would be a huge step forward for the franchise. Sink – Oakland Raiders – The Raiders lost 34-14 in Miami to a surging Dolphins team, and while the loss in itself isn’t terrible, getting blown out like they did is. Now the Raiders are in a dogfight with the Broncos for the AFC West title. Both teams are 7-5, and Oakland’s trip to Green Bay this week means that he Raiders have the worst of the schedule draw. That means the Raiders need to bounce back in a big way, and quick, if they want to finally make it back to the playoffs. Float – Dallas Cowboys – The Cowboys lost 19-13 in overtime in Arizona, which isn’t a terrible loss. But it is a missed opportunity to seize control of the NFC East. Dallas still has a one-game lead, in large part because everyone else in the division lost as well. But if the Cowboys are going to be serious contenders, they will need to take care of business in games like the one they just lost. Instead, Dallas must now be very careful about its two matchups against the New York Giants, the first of which happens this week in JerryWorld. Rise – Baltimore Ravens – The Ravens once again showed that they can compete with and beat the top teams in the league with a 16-6 win over the 49ers on Thanksgiving night. The win featured nine sacks, which is a huge statement. The Ravens have had their downs, but at their best they can outperform any other team in the AFC. Sink – San Diego Chargers – The Chargers got Tebowed, losing to the Broncos 16-13 in overtime. Once again, the once-potent Bolts offense struggled to put up points. It’s hard to pinpoint what’s wrong with Philip Rivers and company, but something is undoubtedly wrong, and that has left the Chargers looking up at the rest of the AFC West. 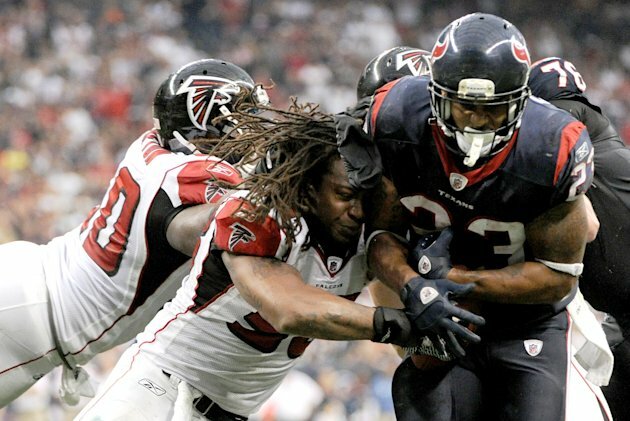 Float – Houston Texans – In their first game without QB Matt Schaub, the Texans lost backup Matt Leinart for the rest of the season as well. But Houston still found a way to get the win 20-13 over the Jaguars. Now with T.J. Yates, Kellen Clemens, or a mystery guest (David Garrard? Brett Favre? Y.A. Tittle? ), the Texans must try to protect their two-game lead over the Titans in the AFC South. It won’t be automatic, but Houston’s strong running game and defense right now appears to be enough. Rise – Chicago Bears – The Bears are on a serious roll, and they showed just how well they’re playing by thumping the Lions 37-6 in Soldier Field. The team has figured out how to protect Jay Cutler, which makes the passing game more potent and takes some pressure off of star RB Matt Forte. And the Bears’ defense is playing as well as ever. At 6-3, it’s a long shot that the Bears can catch the Packers, but they look every bit like a playoff team right now. Sink – Philadelphia Eagles – The Eagles have talent, but they simply aren’t going to get it together this year, and a 21-17 home loss to the Arizona Cardinals is the nail in the coffin. QB Michael Vick is inconsistent, the defense is less than the sum of its parts, and to top it all off, DeSean Jackson got benched for blowing off a team meeting. The defensive coaching staff will likely get fired after the year, and if head coach Andy Reid isn’t careful, this situation could spiral out of control to the point that his long tenure is endangered. Float – New York Giants – The Giants failed in their comeback attempt in San Francisco, but a 27-20 loss to the 49ers in San Francisco isn’t reason for concern. It looks like the NFC East is going to come down to the Giants and the Cowboys, and so while the Giants’ schedule gets tough down the stretch, having both games between those teams left to come will determine the division title. Rise – Cincinnati Bengals – The Bengals took care of business in Seattle, taking an early lead and then getting two return touchdowns to run away with a 34-12 win. That’s an impressive victory, given the travel, Seattle’s rabid home crowd, and the Bengals’ reputation. At 5-2, the Bengals are a legitimate playoff contender, and if they can steal a game from the Ravens or Steelers, they’ll suddenly be in the thick of the AFC North race. Sink – New Orleans Saints – After a dominating 62-7 home victory over the Colts in Week 7, the Saints fell behind the Rams in St. Louis and couldn’t mount a comeback. The 31-21 loss exposes the biggest problems with the Saints – the defense. Coordinator Gregg Williams’ attacking style is great when you’re playing with a lead, but it leaves you vulnerable in a way that doesn’t work as well when you’re trying to climb out of a hole. That’s the reason we didn’t bank on the Saints as a legitimate Super Bowl contender before the season; it’ll be interesting if this problem turns its ugly head again. Float – Baltimore Ravens – The Ravens trailed the Cardinals at home 24-3 late in the first half, but rallied to take a 30-27 win. That wasn’t a great performance, especially the week after a stinker in Jacksonville. But it keeps the Ravens in position leading up to a key Week 9 game in Pittsburgh. If the Ravens can win this week and sweep the Steelers, they’ll be in pole position for not only the division title but a bye.